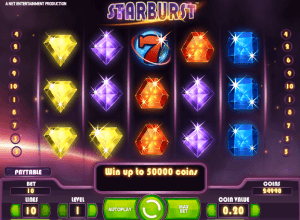 Starburst is another instalment from one of the biggest casino game developers in the industry, Net-Entertainment, and it’s another characteristically colourful and vibrant affair, but not necessarily similar to previous slot instalments from Net Entertainment. Starburst is by the way a very popular machine that casino rooms are giving out free spins on. Whilst Starburst is colourful, its graphics are somewhat laboured and simple and there is very little in the way of animation throughout the game. If you couple this with the obvious lack of special game play features then you might start to think that Starburst is a dull, boring game not worthy of your time. Oh, what a mistake to make that would be. Starburst’s genius lies in its simplicity. There are limited graphics and animations during the game but the backgrounds and sound effects are fabulous, but they don’t distract from the game. The game play is simple but this just increases the usability of the game, inevitably making the game easier to play and master and thusly increasing the likelihood of a payout. If you are new to casino slot games then Starburst really might be the one for you. Starburst has a wide scope of bet amounts, as we have become accustomed to with Net-Entertainment’s games, ranging from 10 cents (1 cent on each of the available ten betting lines) to $100 ($10 on each of the available ten betting lines) allowing pretty much any user to make a bet in line with their budget. So what kind of game play features can you expect? Well the only real special feature is Starburst Wild which can appear on any of reel two, three or four and expands to cover the whole reel. This dramatically increases your chances of winning and is one of the more generous features you will find in any slot game. Atop of this there are a variety of win combinations for you to take advantage of while playing, namely, full screen, stacked, boxed, combos and win both ways, ensuring you have plenty of chance to win. By scoring stacked wild symbols on the second, third and fourth wheels, you will trigger a free spin where the stacked wilds stay in place. If you hit more wilds during the free spin, you will trigger more free spins but you can only trigger three as a maximum. The real golden deal with free spins comes from the casinos themselves – because of its simple interface the game is popular with beginners and therefore free spins on Starburst is a popular welcome bonus at a lot of casinos. Starburst Touch has been available for mobile devices since 2012 so nothing prevents you from playing it wherever you are. Starburst is available on pretty much every casino that offers slots from Net Entertainment. Some prominent ones with good free spins deals on Starburst are BGO Casino, Mr Green Casino, Leo Vegas and Casumo. It isn’t going to have seasoned casino slot gamers lusting after it, but Starburst from Net Entertainment is a solid slot game with a real chance of winning. It’s ideally suited to the newer gamer and a great stepping stone onto some of Net Entertainment more complicated and enthralling games.